The Philippine Atmospheric, Geophysical and Astronomical Services Administration (Filipino: Pangasiwaan ng Pilipinas sa Serbisyong Atmospero, Heopisiko at Astronomiya, abbreviated as PAGASA [pagˈasa], which means "hope" as in the Tagalog word pag-asa) is the National Meteorological and Hydrological Services (NMHS) agency of the Republic of the Philippines mandated to provide protection against natural calamities and to insure the safety, well-being and economic security of all the people, and for the promotion of national progress by undertaking scientific and technological services in meteorology, hydrology, climatology, astronomy and other geophysical sciences. 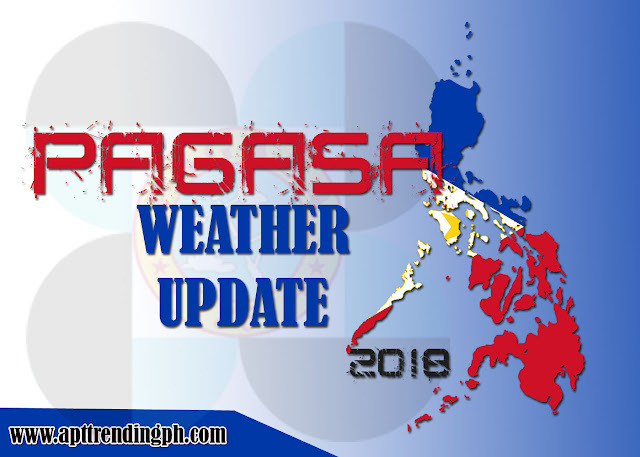 Created on December 8, 1972 by reorganizing the Weather Bureau, PAGASA now serves as one of the Scientific and Technological Services Institutes of the Department of Science and Technology. Metro Manila, Ilocos Region, Cordillera Administrative Region, Batanes, Babuyan Group of Islands, Cavite, Batangas, Bataan and Zambales will experience a possible flooding or landslides due to moderate to occasional heavy rains caused by Monsoon Rain brought by Southwest Monsoon.